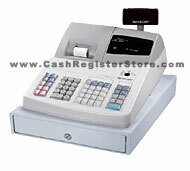 Sharp ER-A242 Electronic Cash Registers at Cash Register Store. The Sharp ER-A242 is designed for general merchandise, small specialty stores, and small hospitality establishments. The Sharp ER-A242 is an entry level cash register with PC friendly software. Here's a cash register that not only allows the most inexperienced user to be productive in a short time, but also includes easy programming software so that the user can personally set pricing, modify text, set plu's, print graphic logos on receipts or generate periodic sales reports and upload the electronic journal to the PC. Screenshots are shown to the right. The Sharp ER-A242 cash register has a convenient footprint and comes with a heavy-duty metal cash drawer with removable till. Thermal printing is highly reliable, fast, quiet, requires no ink ribbons and provides graphic support.